Join us for an evening of outrageous fun! 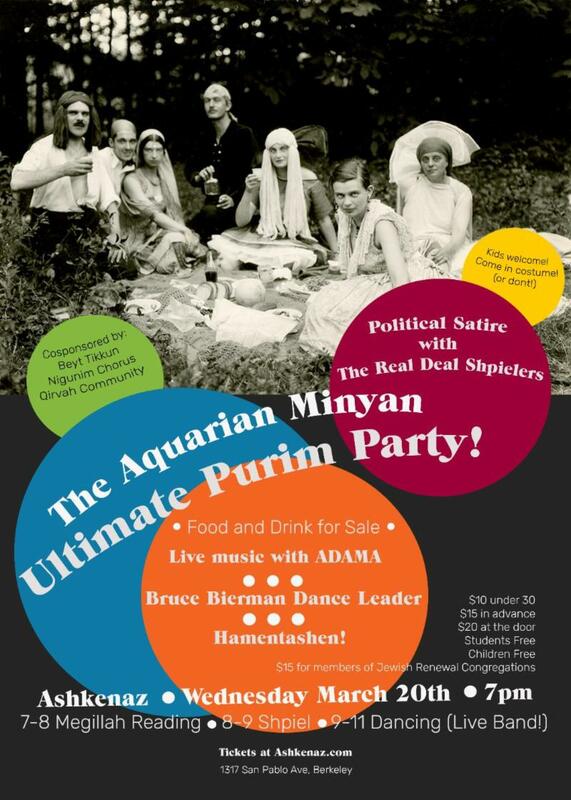 Celebrate Purim in style and come together to be a part of a 45 year tradition with Aquarian Minyan. Come for the megillah reading, stay for laughs and political satire with the Real Deal Shpielers. Later in the evening we’ll have dancing with Adama and dance leader Bruce Bierman! Show up for just part of the festivities or stay for the whole megillah! Come in costume (or don’t)! Hamentashen! Food and Drink! There’s something here for everyone. Check out our Facebook Event Here and help make our event a big success by sharing it with your friends through your own Facebook page!